Saturday. 6:28 am. Uncannily calm water. Tim and I launch the boat early. The sun in the east shimmers behind light clouds. Granola, yogurt, hardboiled eggs and tea for breakfast. We anchor. Nap. At 9:30 we head back to the dock and pick up our passengers - our visitor from Australia along with Eldest Daughter and Husband, and a Little Miss. A seal swims nearby. Curious. Watchful. He soon dives under the cool sea. The sea sparkles (or "farkles" as someone says). We anchor and stern tie in Royal Cove and hike a short distance to a rocky shore. Blue water dotted with boats of all sorts - big, small, mostly white. They pass to and fro. Open areas on the island are sere and golden. They prompt the Little Miss - "this grass is poky, Nana." We name the place "The Island of Poky Grass." On the white midden beach she prepares dishes of Cobb Salad with Chicken for us. I line them up in a row for a photo and sadly, that stops the game. Patience, Nana. Tiny crabs. Tinier snails. Sea anemones. Waving seaweed of emerald, red, white. Tidal pools are micro-worlds of life. It takes time to sit and watch. To pay attention. To marvel. A gull dives down and pulls up lunch - a squirming starfish. We watch as he chews, gulps, and swallows. There is a big lump in his neck, but as he stands there, the lump slowly descends and disappears. Does the starfish wriggle yet? The sun glares down. Heat shimmers on the land. Sea breezes cool. Treasures are captured by camera and left to delight another passerby. We return to the boat for lunch, followed by naps and reading. Beautiful photographs! I especially like the sea and the sailboat. ahhh...love the seal photo..sure must have had a great day...it's all so pretty. How lovely to share your day on the water. I love calm days on the water, and yes it's so much cooler there. Lakes, rivers and the sea are truly the place to be at, during these hot summer months. What a lovely day to be out on the boat and on the island. The seal is so cute. And I love all the beachy scenes and images. Lovely mosaics. Happy Monday, enjoy your new week ahead! Lovely vistas. I especially like the one with the sailboat! Have a wonderful day! Aw, our West Coast perfection, beautifully caught. Thank you! Gorgeous! How still and calm the water is. It looks "cool". Gorgeous images. Happy Monday! Ah...what a divine post! I could almost feel the sea breeze and taste the salt air! Your narration was just perfect to go along with those phenomenal photos! What a wonderful outing. Such pretty photos of the water and the sail boat. I enjoyed reading about your journey and seeing all the wonderful photos of this special time. The 'pokey grass' made me smile as I know the feeling well. Your outing made for a nice day and I did notice the word 'nap a couple of times. Now I don't feel so bad when I doze off for a catnap after my afternoon tea at times. :-) It's good to recharge, isn't it? What a beautiful day and beautiful images…hope you're having a great start to your week! What lovely photos! I do miss the seashore and all the sights, sounds and smells that go along with it., along with the pretty seashells that are fun to collect. Your Little Miss has a wonderful imagination, Lorrie. Perfect for a hot summer day. Isn't this weather something? I can't say I was unhappy to see the much cooler air come in this morning - it is most delightful. I love the whole post - photos and text, sounds like a wonderful day, including the nap. LOL! I ran into some pokey grass on a hike this weekend:) LOVED this post--especially the seal (how cool is that?) and the calm water! Lovely. Sounds like a perfect day, such a pretty place to spend time with your friends and family and what gorgeous mosaics you've created to remember it by. I'm sure you and your guests had a wonderful day bobbing around our beautiful waters, lovely photos Lorrie!! How I love my visits to your perfectly beautiful enchanting spot on our earth-your photos and words delight me! What a beautiful serene spot! Now that sounds like a perfect day to me, including the Cobb Salad. Just beautiful! Thanks for sharing your day with us here. Sounds like a perfect day spent with friends and family. BC is such a gorgeous place, Lorrie. I do love it there! Looks like heaven. 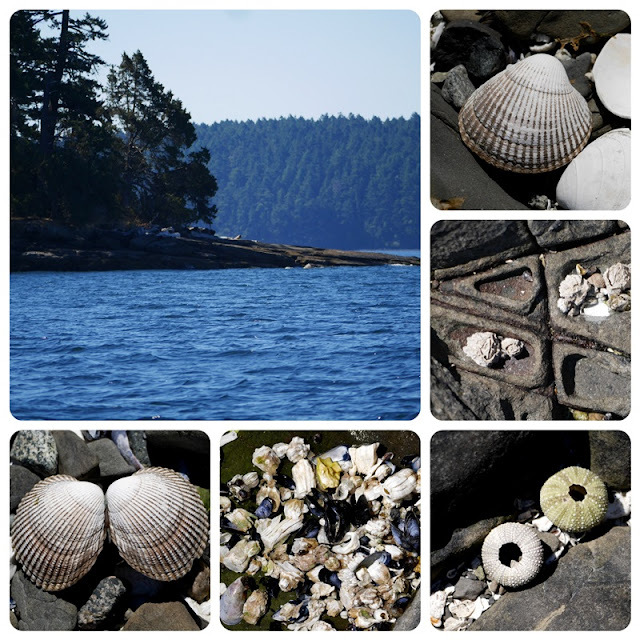 I love the coast and all those fantastic shots of the blue sea, the waves and rocks & sea shells. I think I need to get out of the country for a break, it's been so hot our grass is scorched brown, and so are a lot of my plants. But a break away will have to wait, till all the visitors to our holiday home have been and gone and that won't be till the end of Sept. Enjoyed seeing it through your camera lens. get in the way with our cameras. Been there too!